sponsors | 2009 SL® Footwear Expo! JC’s – 2 pairs of shoes: All Black & Strike! 24 Shoo Shoes – Shoes! 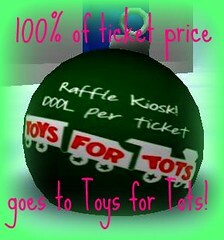 Thank you everyone who participated in the raffle sponsorship and for helping to raise alot of $$$ for Toys for Tots! Questions and concerns should be directed to Rosie Shark. Huge Gigantic Thanks to Virtual World i® for their generous donation of 2 Class 5 sims for the duration of this year’s Footwear Expo! Live the fantasy. own your own island, with estate manager rights and complete privacy and control, terraform and ground textures. Many lots of all sizes and prices, click a pager for help 24/7! Congrats to Flickr Contest Winner Evelyn Hartshon! Congratulations Evelyn!!! Our team of savvy photo reviewers selected your photo ‘White Baubles’ as the winner of the 2009 SL Footwear Expo Flickr Contest! Thank you to Evelyn and to everyone who participated in this year’s Flickr contest. There were some wonderful pictures submitted… you can see them *HERE*. Special thank you to: Serenity Mercier, Dove Swanson, Tillie Ariantho, Ashia Tomsen, Adorkable Peapod, IsabellaGrace Baroque, Anessa Stine, and Sasy Scarborough for their generous donations to this year’s events and also for their all around awesomeness! Really. The Raffle Prizes Rock! The Expo is over in less than 48 short hours. That means you need to get down to the EXPO like quick quick FAST and buy your tickets. All proceeds of ticket sales will go to benefit Toys for Tots! Look for the green ornaments like the one pictured above. Click, and pay your L$1000 to buy your ticket! Buy as many as you like. The more you buy the better chance you have to win! I’ve teased you with the names of our fabulous and generous sponsors already, but here it is with the itemized list of what you could win! As you can probably see by the list… the grand prize winner will receive well over L$50,000 in prizes! Very worth the price of a ticket! Soooo, GO.. GO NOW…. buy those tickets!!!!! *please IM Rosie Shark with any questions or if you’d like to be included as a sponsor in the prize package(s).